Eclectic cuisine where the culinary creativity is on par with the musicians playing at the legendary jazz bar in the basement. : You can’t go wrong from the moment you walk through the door. If you go downstairs, you wind up in the best jazz bar in Texas, The Elephant Room; if you walk upstairs, you’ve made it to the culinary equivalent of jazz --- masterfully skilled improvisation --- Swift’s Attic. Emerging from the narrow staircase, the ambience is immediately Austin hip. 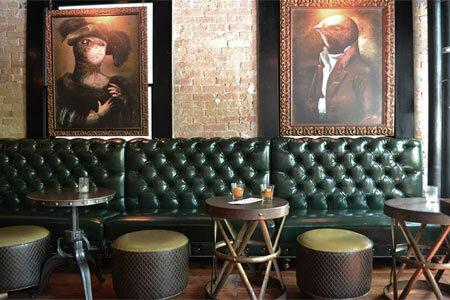 Century-old exposed brick walls are balanced by an artsy Austin-chic décor, including luxurious chandeliers encased in antique bird cages. The setting is perfectly in line with the kitchen’s self-described whimsical approach. The menu changes often, but some mainstays, such as the squid fries and pork cheeks, a deconstructed sandwich that's moist without the marbled fat, remain in the innovative arsenal. Other options might include seared scallops with chimichurri. Save room for the dessert dubbed Popcorn & a Movie: butter popcorn gelato atop a candy bar with root beer gel and caramel corn. Not to be outdone, the bar has concocted a number of signature ice balls, essentially classic cocktails frozen in a large ball swimming in the cocktail itself. Waitstaff is extremely helpful in navigating the eclectic menu, and equally attentive to service. Sunday brunch finds a Bloody Mary buffet that goes beyond the basics with garnishes like bacon and capers.